Ryan Mendoza is a Berlin-based, American painter who has taken on a different sort of conceptual project with his latest work, alternately known as ‘Detroit House’, ‘Coming Home’ or ‘The White House’. Each of these epithets is suggestive of a different dimension of thought addressed by the work. 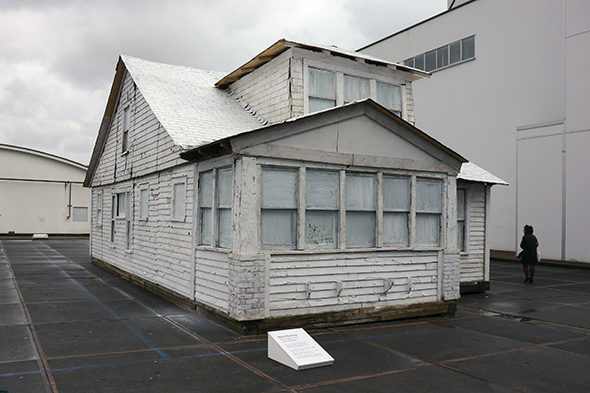 We spoke to Mendoza at Art Rotterdam last month, where the house from Detroit had been shipped and reconstructed outside the main building of the Van Nelle Fabriek. The piece was commissioned by the Verbeke Foundation in Belgium, where it will be on permanent display from April onwards. Alison Hugill Why is the house painted white? Ryan Mendoza There’s an enormous attraction to the poverty and to people’s problems in Detroit. There’s something instinctive about that: we’re attracted to things that are terrible. This project is not really about that. This project is about me trying to bring a house with me from America, back to Europe. What do we Americans do? We colonize the world with very simplistic ideas that are obviously not functioning very well. We say capitalism is the preferred economic form. When Americans vote for Sanders, every vote for Sanders is a vote for Europe, basically. Cause he’s looking at a European model. There’s a lot of racism in America. AH But white paint traditionally has a neutralizing effect, turning something away from its specificity and into an art object. It was very painful for me to paint it white, especially the front door. I did it because I wanted to protect the house from the voyeuristic nature of people, their need to get something out of someone else’s tragedy. The white paint is protecting the house, which is a bit like a body that has died. This is a prolonged moment before the burial. This is definitely a house that would have been demolished. AH So, you purchased the house? Did you ever live in it? RM No, I didn’t. The house is very similar to a house that I lived in just before I left America, in Pennsylvania. My mother’s mother died and left us a small house. It was a family crisis time and just before I left I put packing paper on the windows. The house became sort of like an art project. My mother was on the Geraldo Rivera show because the neighbours, on all four sides, had video cameras pointed on our house, which had no curtains. My mother was Miss Pennsylvania. She had neighbours who were video taping her walking about half naked in her house and she went to trial. So the videos are on public record. I was about 20 years old and the packing paper intervention was my first art project: I didn’t mean to do it, I was pushed to. Now I am doing the same thing. Covering something protects it, and I am thinking about this as a veil on top of the corpse. In this house here, I have added some footage of my mother interlaced with the photos of the people who used to live in the house, the Thomas family. I found about a hundred photos in the house. AH Is this phenomenon of dying homes common in the 8 Mile area where you took the house from? How much would a house like this cost? RM There are thousands of houses that are about to be demolished. This house was donated to me by Gregory Johnson. 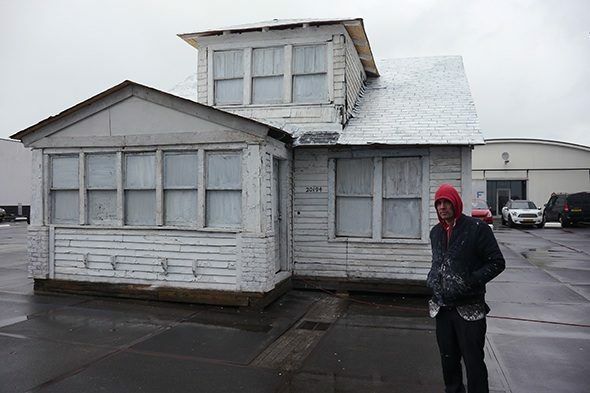 Johnson donated the house to our project, he got it because it was repossessed and auctioned off. I didn’t follow the whole money trail. The housing market there is very depressed. The city of Detroit has decided that many of the homes are not worth saving. To me, that’s racism in a nutshell. People are investing elsewhere, and it’s coming from the top down. People who are living on 8 Mile are struggling to pay their taxes. Three million people lived in the city and now there are 680,000. The people that left, left because there are no jobs. If you’re the city and you know there’s mass unemployment, yet you keep taxing people for their houses, you know that people are going to lose their homes. The city has all these houses that are decaying because no one’s there to maintain them. The city has created all these problems. So I went to them and said: “I see these problems. I’m not black, I’m not from Detroit, but I’m American and I want to do something.” They didn’t want to do anything. So I had to do my project in secret. AH How did Art Rotterdam get involved with the project? RM They were interested through word of mouth. I’ve been working on the project for a long time. AH Were you always intending to move the house? 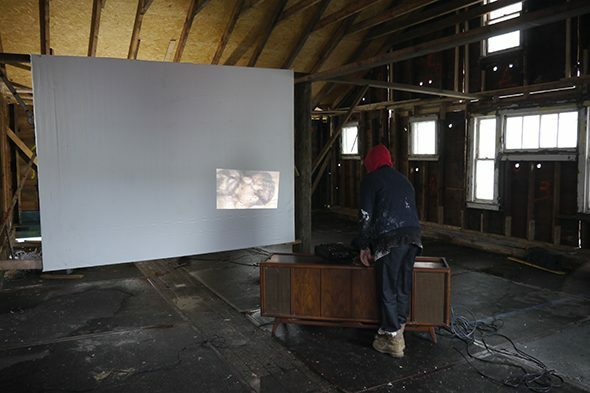 RM The house will go on permanent exhibition with the Verbeke Foundation in Belgium. It has a final destination. Other people have seen it and would like to show it elsewhere but it’s very delicate and difficult to take apart and reconstruct. AH Do you see it as a timepiece connecting to a period in Detroit or America’s history that you want to immortalize? RM I think about the house in terms of the music that was heard in the walls of the house. We found lots of records inside and music players: a walkman, a CD player, old radios, 8-track players, and a huge radio which is actually in the house now. This is a very lively burial. Instead of digging a hole in the ground and closing it up in there, in the night time, when it’s dark outside, you can see the lights shining. AH And you can hear construction sounds as you walk around the house. RM Yes, I put together a sound collage. I put images of my mother, who was Miss Pennsylvania in 1959 – she looks like something between Julianne Moore and Lindsay Lohan. At night the house comes to life a bit, with the lights and the music on. AH It’s a lot about your personal connection to the house. RM Yes. As political as I like to think that I am, I am actually just trying to find my own way to do something. We have a crisis in Syria, for example. If I had taken a house from there people would have looked at it in shock and said: ‘We have to do something’. But America has its internal problems, too. Did you see the mess he left behind in Detroit after he took the house? Shame you’re promoting him. He just added to the problems there with his art piece. Unacceptable.